Sickle Cell Disease (SCD) is an inherited blood disorder that affects over 100,000 Americans — and millions worldwide. SCD is often identified with the African Americans, but it also frequents people of South Asian, Middle Eastern, Hispanic, and Mediterranean descent. According to the CDC, approximately 1% of children with SDC will die within the first 3 years of life — often from stroke and without warning. Some two million Americans are carriers of the sickle cell gene. 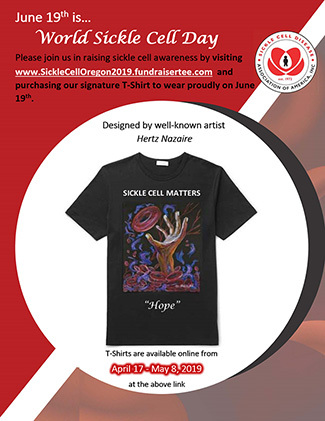 The Sickle Cell Anemia Foundation of Oregon is a 501(c)(3) non-profit organization dedicated to educating vulnerable populations and to encourage testing for the presence of this painful and life-threatening, but treatable disease. Our immediate objective is to identify all the patients and carriers of sickle cell disease living in Alaska, Idaho, Oregon, and Washington state. We are dedicated to assessing the health care needs of these patients and helping them by facilitating regular access to appropriate health care providers and services. Our Pacific Northwest outreach program aims to provide individuals with the information they need to be tested for the presence of sickle cell disease. Diagnosed patients are encouraged to sign up with the national “Get Connected” Sickle Cell Anemia registry. What does the Sickle Cell Anemia Foundation do? The Sickle Cell Anemia Foundation of Oregon is a non profit 501(c)(3) corporation that is dedicated to serving the needs of Sickle Cell patients across the Pacific Northwest. What is the Get Connected program? Click here to learn more about the Get Connected program. The Sickle Cell Anemia Foundation of Oregon is working to build bridges to sickle cell patients and carriers in Oregon, Washington, Idaho and Alaska. If you or a family member has sickle cell disease or is a sickle cell carrier — or if you are interested in finding out about free testing and diagnosis — please CLICK HERE to learn more.